The Yates family of Camden, New Jersey first appear in United States census records in 1850. The family was living in the Kensington section of Philadelphia, Pennsylvania. 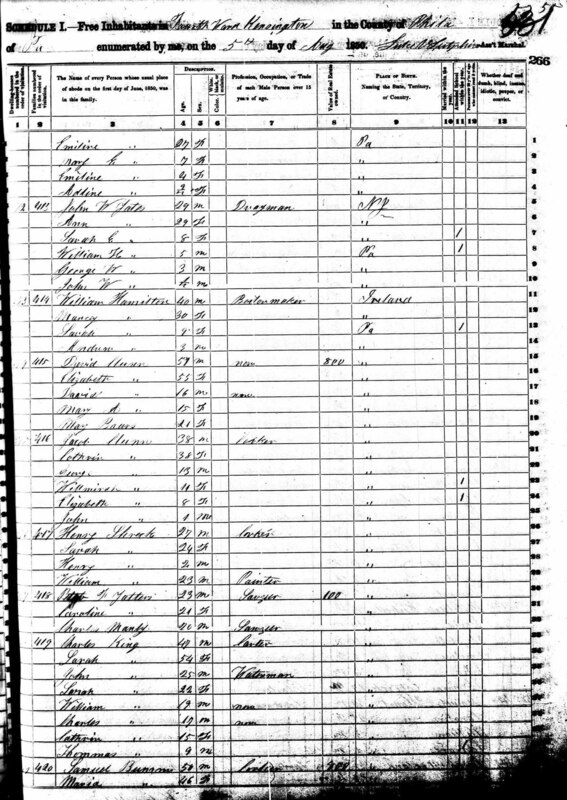 The Census sheet dated August 5, 1850 lists John W. Yates (for identification purposes John W. Yates I) and his wife Ann, with children Sarah, William, George W., and John W. Yates II. Ages are given as 29 for both parents, 8 for Sarah E., 5 for William H., 3 for George W., and John W. II was then a newborn. It should be noted that ages listed on census sheets in those days were often not precisely accurate, this will show up later. Occasionally children's names were mangled as well. John W. Yates supported his family as a drayman. A drayman was historically the driver of a dray, a low, flat-bed wagon without sides, pulled generally by horses or mules that were used for transport of all kinds of goods. It is highly likely that he was engaged in transporting goods to and from ships along the Philadelphia waterfront. He later would work aboard ship, as shall be evidenced below. 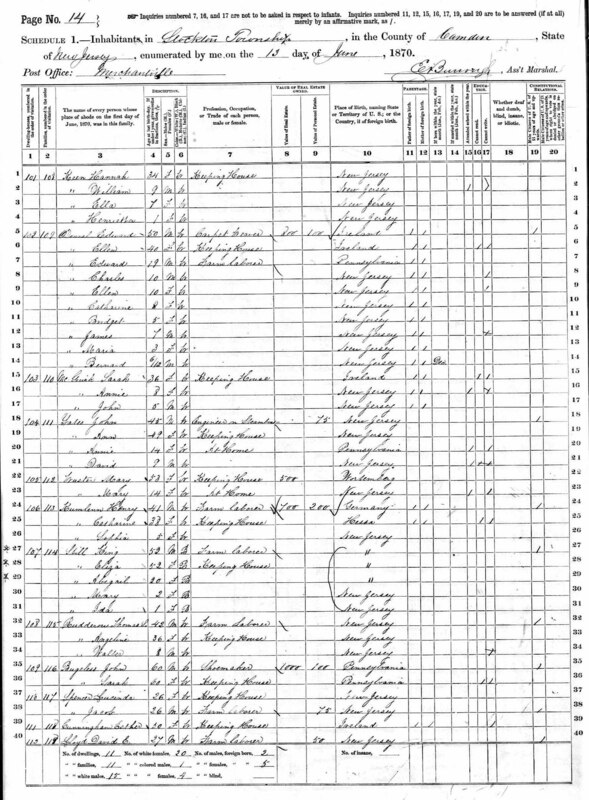 When the next Census was taken, on July 4, 1860 the Yates family was living in Stockton Township, Camden County, New Jersey. The township consisted of what is now the Borough of Merchantville, and the Cramer Hill and East Camden sections of the City of Camden, New Jersey. John W. Yates I was now working as a fireman aboard a steamboat, i.e., his job was to shovel coal or wood into the ship's boiler as fuel. The family as listed in the census are as follows: John W. I and wife Ann (both aged 36, see above note about age discrepancies in the census), children Sarah E., William H., George W., John W. II, Winfield S., Anna M., and Lorenzo, aged 2 months, whose apparently as he got older went by the name of David... his full name may have been David Lorenzo Yates or Lorenzo David Yates. All the children were at home except William, who was working as a farm laborer, not at all uncommon then in the very rural Stockton Township of 1860. The June 1870 Census shows the children growing older and moving out on their own, and sadly in some cases perhaps dying. John W. and Ann Yates only have two children at home, Anna and David, ages 14 and 9 (close enough). The parents ages are given as 45 for John W. and 49 for Ann, which may account for the discrepancies in the previous Censuses. John W. Yates I occupation is now engineer on a steamboat. He seems also to have been counted twice, in Stockton as John Yates and in Camden as Wesley Yates, with similar ages ("Wesley" Yates in Camden is 49) and identical occupations. "Wesley" Yates was boarding with Edward Andrews and family at the time of the Census. Of the older children, John W. Yates II was living in what is now Merchantville with Thomas McCann, both men were farm laborers. George and Winfield Yates were living on the farm of Edward Keen, also in Merchantville, and both young men were also working as farm laborers. In the early 1870s George W. Yates appears to have married Eliza Peak, the daughter of Aron and Abigail Peak. Aron Peak worked as a steamboat engineer and George may have met Eliza through their father's professional acquaintance. Two sons came of this marriage, William and John W. Yates III. The 1870s, however, were not good for the Yates family, as John W. Yates passed away, and tragically Eliza Peak Yates also died, in 1877, leaving George Yates to raise his two sons. 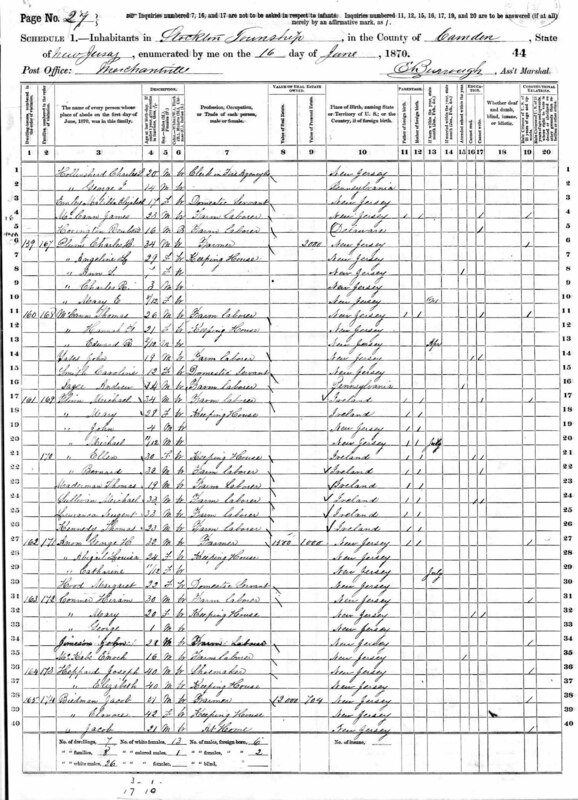 The 1880 Census shows the Yates family living at 1126 Newton Avenue in South Camden. George Yates is working as a teamster. His widowed mother is at home, as are younger brothers Winfield, also a teamster, and David, a farm laborer. Sons William, age 8 and John W. III, age 6, are at home. There apparently were some custody issues raised by Mrs. Peak in the 1880s regarding the raising of George Yates' boys. I do not have documentation as to how this was resolved, however records indicate that John W. Yates III and his father stayed close. 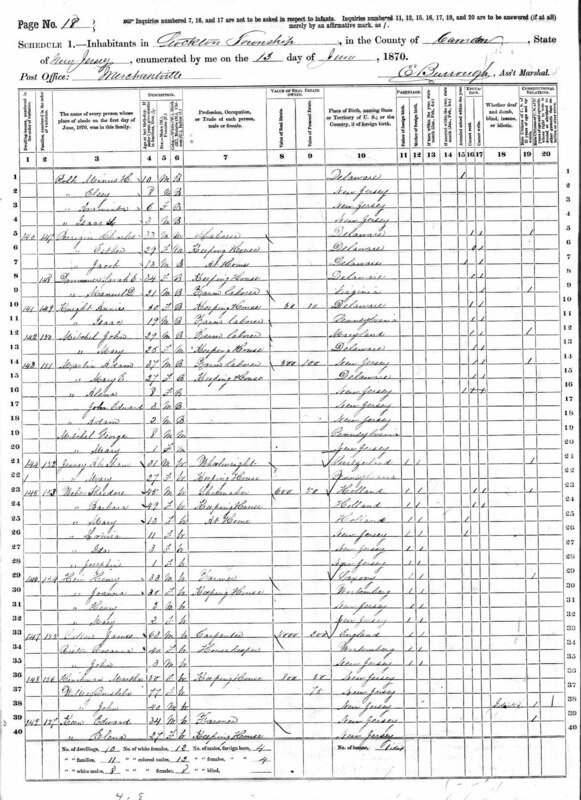 No census records exist for 1890, as they were lost in a fire. City Directories for the period, however, give a good picture of the family's movements and occupations in the years leading up to the 1900 Census. The 1881 Directory lists George Yates, teamster, at 1417 South 4th Street. A John Yates, who MAY have been George's brother John W. Yates II, was living at 838 South 8th Street and working as a farm laborer. This person lived in Camden into the 1920s and will be researched further in the future. The 1882-1883 Directory shows Ann, George, David, and Winfield all living at 313 Pine Street. George was still a teamster, David a fireman for the American Dredging Company, and Winfield worked as a blacksmith at John H. Dialogue's shipyard on the waterfront below Kaighn Avenue. The 1884-1885 Directory shows the Yates family beginning to move to East Camden, which was now part of the Town of Stockton. Merchantville had split off in 1873 and the remainder of old Stockton Township reorganized as a Town. George Yates was working as a laborer and living on Federal Street at the corner of 19th Street. Winfield was living at 327 Mechanic Street, still working as a blacksmith, and a "D.W. Yates", presumably David, lived at 1215 Knight Street, a small street below Kaighn Avenue west of Ferry Avenue. Only George is listed in the 1885 Directory, still working as a laborer. His address is given as Federal near 20th Street. The 1887-1888 Directory shows George living on Federal near 23rd Street. still a laborer. "Ann Yates, widow of John" is listed at 331 North Front Street. The 1888 Directory shows George Yates, laborer at "Grant Avenue near Horner Avenue" in Cramer Hill. These streets were renamed when the Town of Stockton became part of the City of Camden in 1899. Grant avenue became Concord Avenue, and Horner Avenue became North 28th Street. The 1890-1891 Directory shows George Yates living on Marlton Pike near Federal Street in a neighborhood then called Wrightsville. This would put him very probably where the new Thomas H. Dudley School now stands. The Yates family would maintain a presence in this neighborhood for many years to come. The 1891-1892 Directory shows George Yates in the same location. He was now working as a laborer for the Pennsylvania Rail Road, which had a large switching yard and car maintenance facility nearby, which is still in existence today. George would work for the P.R.R for the rest of his life. George was still working in this capacity when the 1894-1895 Directory was compiled. His address at this point it was "Stewart Avenue near State Street", just across Federal Street from his previous home. The 1895-1896 Directory shows George Yates had moved to 1917 Cooper Street. Also listed at that address was George's second wife, Ellen (or Ella) Yates, who had a candy store there. The 1896 Directory shows that George Yates had been promoted from laborer to flagman. The family still resided at 1917 Cooper Street. David Yates was also living their, working as a fireman, i.e., as a boiler operator, not as a fire fighter. The 1897 Directory shows the Yates family still at 1917 Cooper Street. George's son John W. Yates III had by the gone to work as a laborer. David Yates was still at the address as well. The 1899 City Directory reflects some changes. George and Ellen Yates were still living at 1917 Cooper Street. David Yates had married, and was living at 1919 Cooper Street. John W. Yates III (listed in the directory as J. Wesley Yates) had also married, and was living at 61 Marlton Avenue. The 1900 Census shows all three branches of the Yates family as previously tracked. George Yates is now at 1987 Cooper Street, with his wife of 18 years.... her name is given in the Census as Libbie, which possibly is a nickname. Their children are George W. Jr., 13, Lizzie, 6, Walter, 4, and Edward, 1 year of age. David Yates and his wife of 9 years, the former Mary A. Mayer, are living with their 1 year-old daughter Lillie at 1938 Federal Street. Also at home with them is Mary's father Peter Mayer. David Yates worked as a day laborer, Peter Mayer as a farm laborer. 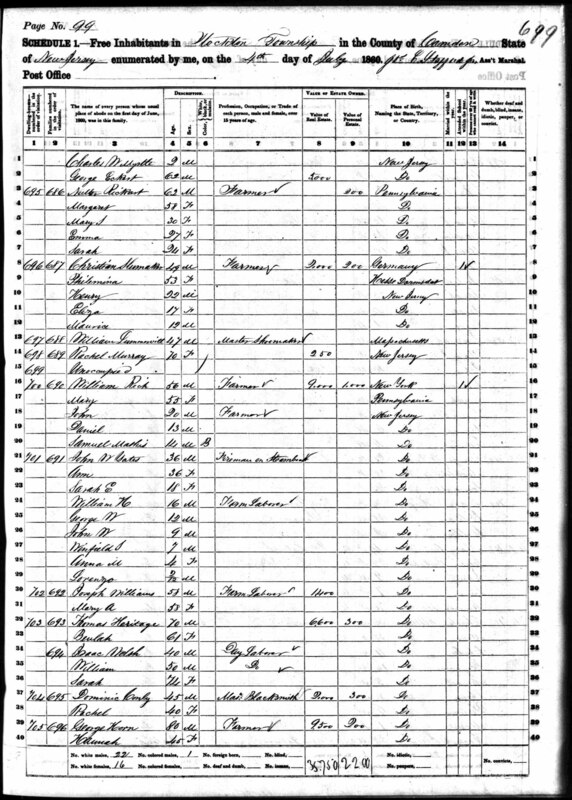 The 1900 Census also shows John W. Yates III and his wife Louise at 107 Marlton Avenue. John W. Yates III was working as a laborer for the railroad. 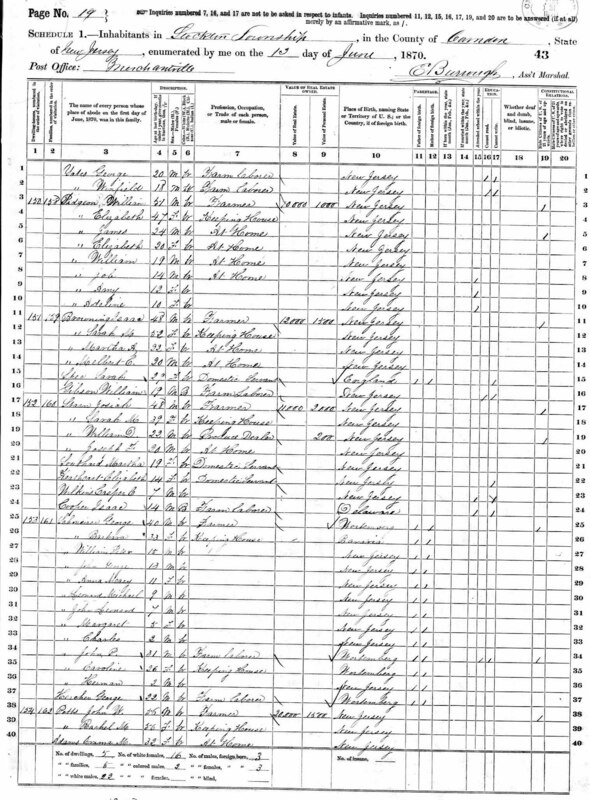 The children at home were Josephine (the product of Louise's previous marriage), Charles, Viola, and John W. IV (also known as John W. Yates Jr. in later census sheets). John W. Yates III brother William H. Yates appears to have moved out of Camden by 1900, first to Voorhees and then to Collingswood. He passed away due to heart trouble in late June, 1912 at the age of 39, his daughter Elizabeth also died of heart trouble in 1916, at the age of 20. 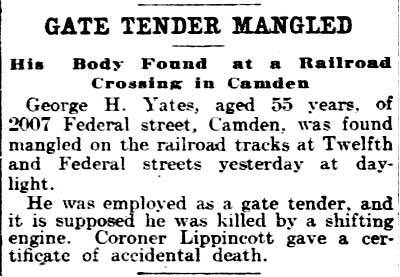 Tragedy struck the Yates family in July of 1904 when George Yates was killed after being struck by a train while at work. The 1906 Directory shows John W. Yates III and family still at 107 Marlton Avenue. His stepbrother, George W. Yates Jr. is listed as a morocco worker, that is, a leather worker, living at 2007 Federal Street. An "Allen Yates" is also listed at that address, this is probably an error, Ellen Yates being the probable correct entry. 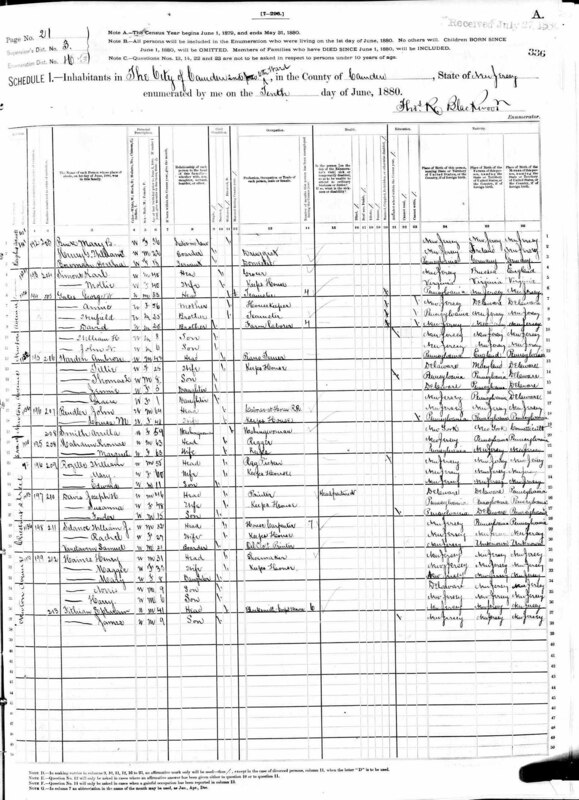 The 1910 Census shows George W. Yates, glazier at a morocco works, living at 2025 Federal Street with his wife Mary, children Emma and Raymond, and his sister Lizzie. John W. Yates III and family were still at 107 Marlton Avenue, two more children had come, Alberta and Esther. He was working as a stationary engineer. The oldest two children had gone to work, Josephine as an operator in a lace factory, Charles as a stock clerk in a stationary store. David and Mary Yates and their daughter Lily May were at 77 South 24th Street. David was then working as a caulker in a pipe factory. They had moved to 2262 Mickle Street by 1918. The 1918 City Directory and the 1920 Census shows that John W. Yates III and family had moved to 25 North 23rd Street, still in the same East Camden neighborhood. John W. Yates III was still working as a stationary engineer. Son John W. Yates IV, also known as John W. Jr. was then serving with the United States Army. The only children still at home were Alberta, Sylvia and Esther. Step-brother George W. Yates Jr., still at the leather works, and his family were at 39 Morse Street. By 1918 step-brother Edward Yates had followed George into the leather trade and was living with his wife Myrtle at 2112 Watson Street. By 1924 John W. Yates IV (John W. Jr.) had married Mary Jones and taken up the boilermaker's profession. He lived with his wife Mary at 928 Woodland Avenue into the 1930s. When the Census was taken the Yates family included two daughters, Florence and Ruth. At least one son would follow. By 1947 the Yates family had moved to 2400 South 8th Street. The 1930 Census shows John W. Yates III and daughters Esther and Sylvia were still at 256 North 23rd Street. The family was still at that address when Louise Yates passed away on July 20, 1939. A short walk away at 2205 Howell Street lived his half-brother, George W. Yates Jr., and his family- wife Mary, daughter Mildred, and sons Walter, George W. III, John, and Wilbur. The family later moved to 519 Borton Street in North Camden. George W. YAtes Jr. passed away on March 27, 1940. On February 1, 1930 John W. Yates IV (John W. Jr.) joined the Camden Fire Department. After serving with distinction for 35 years, he retired on April 1, 1965. Last a resident of Absecon, New Jersey, John W. Yates IV (John W. Jr.) passed away on August 7, 1974. 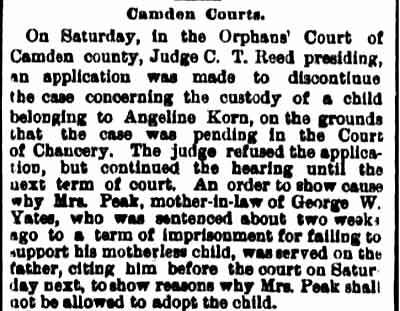 The Yates family was a part of the City of Camden for many years thereafter. David Yates, the grandson of John W. Yates IV (John W. Jr.), was named Chief of the Camden Fire Department on June 1, 2010, and served in that capacity until his retirement on December 31, 2010.